Thirty years ago Suha Shoman and supporters launched an initiative in support of contemporary artists from Jordan and the Arab world, laying the foundation for what would become Darat al Funun, a ‘home for the arts’. 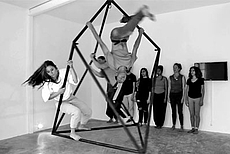 It became a meeting place for artists, a hub for artistic practices, experimentation, and critical discourse, and an oasis for researchers and fellows, in the midst of the turmoil surrounding us. Artists, performers, architects, designers, archaeologists, researchers, poets, writers, musicians, and filmmakers believed in a common vision. 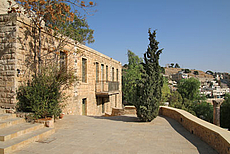 Today, Darat al Funun is housed in six renovated historical buildings dating from the 1920s, with restored archaeological remains in the garden of a Byzantine church built over a Roman temple. 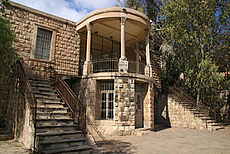 In addition to programming exhibitions, artist talks, film screenings, performances, poetry readings and concerts, Darat launched the Summer Academy in 1999, ran multi-disciplinary workshops, initiated an exchange residency program, opened The Lab for experimental art projects, established a Ph.D. fellowship for academic studies on Arab art, and more. Starting around the millennium, the world as we knew it imploded. Wars brought political and socio-cultural upheavals, population transfers, identity crises, and environmental disasters. Lost causes still await resolution. The internet age and social media accelerated globalization. Over one hundred artists answered the call. In three phased exhibitions planned for 2018, established artists side by side with emerging artists will be featured, together forming a constellation of new narratives and interrogations. Akram Zaatari (Lebanon), Amal Kenawy (Egypt), Ayham Alsammak (Jordan), Dana Kaoukji (Jordan), Dana Rousan (Jordan), Dina Mufti (Jordan), Firas Shehadeh (Jordan), Hassan Khan (Egypt), Haya Abdul Hameed (Jordan), Himat Ali (Iraq), Hosam Omran (Jordan), Ibn Talib (Jordan), Isidro López-Aparicio (Spain), Jehad Al Ameri (Jordan), Joana Hadjithomas and Khalil Joreige (Lebanon), Marwan Rechmaoui (Lebanon), Mohamad Badarne (Palestine), Mohammed Zakaria (Jordan), Munjed Qasim (Jordan), Oraib Toukan (Jordan), Rabih Mroué (Lebanon), Rana ElNemr (Egypt), Sahel Al Hiyari (Jordan), Tala Abdulhadi (Jordan), Wasim Zaid Habashneh (Jordan), Yasmeen Sabri (Jordan), and Yasmine Alnabulsi (Jordan). 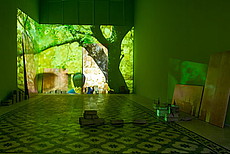 The exhibitions will be accompanied by a full program of artist talks and performances, films from our archive selected by artists, a cultural production seminar and an archival exhibition curated by the Darat al Funun fellows, curators in conversation, workshops, performances, and more.